Just poorly written, giving you absolutely no desire to fight it. With these rough definitions in mind, let’s check out our Top 10 Boring Boss Battles. Ia! Ia! Gong hei fat choy! Merry February everyone, this Thursday passed saw GeekOut Shrewsbury return to form with a whole lot of new faces and new tricks, and I solemnly promise this will be the last Lovecraft themed thing for a while maybe. I’m here to serve everyone’s fandoms, not just to celebrate my own, but dammit if it didn’t turn out to be a good idea to ask for Lovecraft themed Valentines cards. It was also a good idea to drive considering the games I have to carry with me, but I learned some terrible things about trying to park in Frankwell. So I arrived in the Pour House on Frankwell and was surprised to find more than just Murray sat at a table, easily our busiest pre-meet ever with about seven or eight of us, so it’s definitely time to start warning venues of our arrival. Also, consider this a formal request, if you’re planning to show to the premeet please at least drop a comment on the Facebook poll so that I can be prepared and prepare our venues. While it was a lovely surprise, it’s one that could limit our choices in future if we start showing up and asking for large table at short notice. Magic, Lovecraft Letter (sans the madness rules for now) and some general D&D based conversation in warm and comfortable surroundings. Thanks to the Pour House, and don’t think I didn’t spot a few of you looking over at the games in progress. You’re welcome to join in too, and we’d love you to. So it was a rather large crowd that travelled to Montgomery’s Tower, via my car where multiple bags of board games had been left behind during the premeet. I set up the Games Library, we bust open some games, hilarity ensued. There are a lot of pictures of Rhino Hero in this month’s gallery, but what can I say? It’s a very photogenic game. Arkham Horror was a wonderful nightmare to set up, but dammit if we didn’t eventually slay Yig despite the curses and a wholesale failure to close a single portal, but dammit if we didn’t clear up the streets of Arkham with guns and spells and not even dying slightly (once nearly) and I absolutely need to get some bags to keep those damn tokens separated. Is it possible to photobomb oneself? What’s this? Rhino Hero is evolving! My dear mother arrived with a parcel for me early in the afternoon, fresh from the sorting office. I got a Hydradoodle in the very first pack. I am a happy man indeed. More information on Unstable right here. Those who planned ahead seized the advantage, and it’s a shame that Julia’s was left at home because her hasty recreation showed promise. I simply could not decide on a third place, so here are joint second places, you earned your Lego Batman minifigures. But dammit Vinnie, you psychotic mastermind. In he strolls at about half 6 and hands me this madness. I shall forgive Harley misuse of the term “Non-Euclidean” when describing this unending card because it’s as good a description as any. It didn’t end, and not pictured are the illusive pages 5 and 6 which require the artifact to be unwound and remade to be discovered. First prize well earned, another Lego figure and a lucky cat to celebrate the year of the dog. March at the Movies for Thursday 29th which means we have a whopping five week gap! You have this time to swat up on your film knowledge for this month’s terrifying Big Geek Pub Quiz. And on the subject of films, a quick head count; who wants to go see Infinity War after the April GeekOut as part of a big ol’ GeekOut group? Can Board Games Be Scary? When it comes to horror a new king has come to seize the crown, and though the recumbent cinema may still be giving us a few greats, not doubt video games are the heir apparent. But given the renaissance era of board games has produced wonders that even have the power to put chess to shame one wonders, can board games give us that same sense of horror? Can they make us dread, feel closed in, alone, or hopeless? The battle must make you feel like you’re experiencing a challenge. The battle does not have to be a final boss. If you want a quick game that you can pick up and play when you and your friends are looking to kill an hour or two, you shouldn’t be looking through the Fantasy Flight catalogue. Inspired by the works of H.P Lovecraft, a fellow you may have noticed we discuss a lot, comes a cooperative survival horror that takes place in the town of Arkham Massachusetts as it is besieged by unearthly horrors that foretell the coming of something far greater, far older, and far worse. Our plucky investigators must uncover clues, gather eldritch seals, and journey into the unknown to save the world, or die trying. Short version of the set up: Each player takes a character, who has a health value, sanity value, and particular ability; an Ancient One is chosen who will also impact the game, both while slumbering, and if/when awakened. Separate the many decks and tokens, making sure the monster tokens are randomised in some way such as piling them into a cup or hat. Each round players take turns to explore the town of Arkham, it’s various locales and notable features, experiencing strange and terrible moments ranging from an uncomfortable experience with the patrons of Velma’s Diner, to an alien nightmare descending upon them in the docks. All the while the Mythos deck raises new challenges on the world as a whole, challenging the group to race against the Terror Track whose inevitable progress will eventually conjure the Ancient One from beyond to obliterate the world. How could such unimaginable power be prevented? Portals to the other realms are opening throughout the town, spilling forth monsters, but allowing investigators to pass through those places where the Old Ones roam; the Plateau of Leng, Yuggoth, The Dreamlands, R’Lyeh; and in the process gaining great knowledge, allowing them to close, and potentially seal the portals, ending the flow of unearthly terror. Or they’ll go mad, die, or be lost forever to the void. If enough portals are closed and/or sealed the Ancient One has failed to invade Arkham… today. But if it does… oh, if it does… should any one of an alarming number of factors be met and the Old One emerges, it’s a mad scramble to fight it back into the dread domain from whence it emerged. 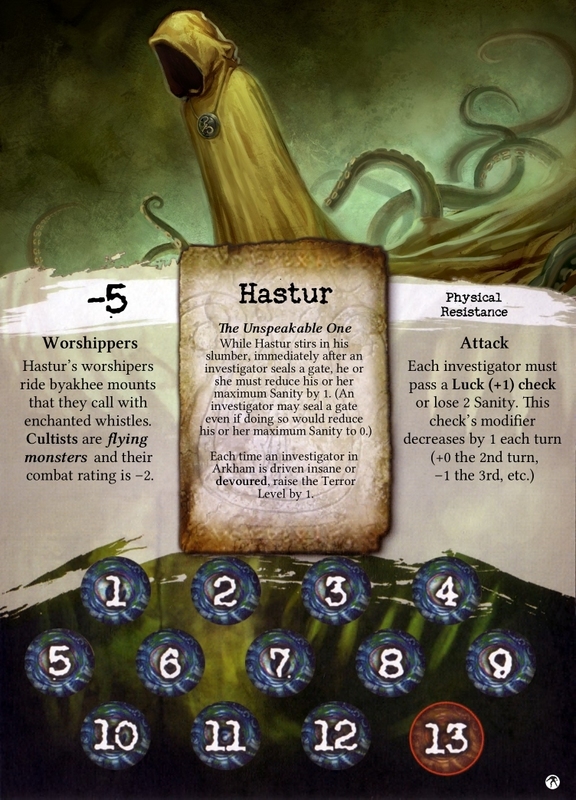 Too many monsters, too many open portals at once, too much fear in the hearts of mortals, or simply too much time elapsing, all of these things can bring the likes of Yog Shothoth, C’Thulhu, Yig, or mighty Azathoth down upon the heads of the investigators, who must use their meagre weapons, failing magic, and inadequate wits to fend off the creature for another lifetime. This is a sincere invitation to anyone who can find me a game that better represents the nature of Lovecraft’s classic style of horror. Daunting, complex, and leaving you feel utterly hopeless and filled with unease; the very threat of what you must face if you do not succeed in the first phase of the game is tension-building stuff. As the game fills with complexity you find yourself facing more and more challenges, the pace becomes frantic, and your pulse only races faster. You’ll grow to fear the streets, the sky, and the inevitable march of time. It makes strategy tough, that’s a fact. You find yourself pursuing each moment rather than planning the long game. Who has the capacity to close portals? What resources to the group have and how easily can they be traded? How much sanity or health can you afford to lose before running for the asylum or the hospital? At any moment, Mythos, a bad roll, or a bad event card can throw all plans you thought you had completely out of the window. With so many variations in terms of character combinations, effects of the various Ancient Ones, random card effects, and the myriad expansions available for Arkham Horror, it can present you with a massive variation in every game giving it incredible replay value, assuming you have that kind of time on your hands of course. Let me start by saying that this game hates you. You need to be clever, cohesive, strategic, and above all lucky at all times to stand a chance of beating Arkham Horror. It’s a tall order to simply prevent the Ancient One from emerging, it’s an even bigger ask to fight it. People will die, and you just have to try and work out whose better off surviving to try again, and if you can control the survival rate at all. Do not play if you like winning, expect to fail. Like all Fantasy Flight games there’s a lot to keep track of, more so for the size of Arkham Horror, and it only gets worse as you start adding expansions, of which I have one, and I’m already daunted. If you plan to play this game in the afternoon set it up in the morning, and don’t plan to be done until the evening. You might be done, but don’t expect it. This means that there’s plenty to forget, and by the time you’re part way through the game and you suddenly realise that you’ve entirely forgotten a rule, or a major factor, or if you suddenly realise you’ve been neglecting to include certain parts, then it can upset the balance of the game. No other game has had me out of my seat and yelling at dice, or so excited I was literally shouting at the friends around the table. This is a Fantasy Flight game, I’m not saying they’re all great, but this one is definitely up there on their hit list, as monstrous as it may be it’s worth all the laborious set up to play. If the sheer size and complexity of this game is simply too much to bare, fret not, for a simplified version exists. Though still complex for its size, Elder Sign provides a faster and easier game experience that could (and frankly should) serve as a gateway into playing the leviathan Arkham Horror. As busy adults with lots of grown up things to do it can be a struggle to find time and space for a game like this, but it’s absolutely worth your time to do so. Shameless promotion here, my friends at e-Collectica games will be celebrating the store’s 10th birthday on October the 15th with their longest ever Games Day, 10:00 – 19:30 at the Darwin Community Centre in Shrewsbury. If you’re in the midlands and want to join us for nine and a half hours of games come on over. We’ll be featuring a Ticket to Ride tournament, a couple of roleplays and your chance to learn some new games, or just play some favourites. More info at the event page on Facebook.